William Clare “Bill” Barker, age 75, of Hays, Kansas, died Sunday, May 20, 2018, at his home. He was born on May 7, 1943, in Norton, Kansas, to Clarence J. and Goldie E. (Van Diest) Barker. He married Priyanai (Suvanasingha) on November 28, 1969, in Little Rock, Arkansas. She preceded him in death on November 30, 1994. He then married Rita J. (Long) on May 31, 1997, in the Old St. Anthony Hospital Chapel in Hays, Kansas. 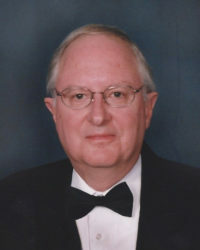 He worked in Oberlin, Colby and Hays in the insurance and banking business and retired in 2008, after 20 years with the Farmers Credit Union in Hays, Kansas. He was a 1961 graduate of Prairie View High School and a 1965 graduate of Kansas State University. He taught middle school for a few years in Buhler and Independence before moving to Hays, Kansas in 1990. He was a veteran of the U.S. Air Force during the Vietnam War and served four years in Bangkok, Thailand and Little Rock, Arkansas. He was a member of the First United Methodist Church in Hays, a Lifetime Member of the V.F.W. Post No. 6882 and the Rotary Club both of Colby. He enjoyed fishing, all sports and was an avid Kansas State fan. Survivors include his wife, Rita Barker, of the home; one daughter, Anita Thiel and husband, Jess, Levant, KS; two step daughters, Sue Molnar, Hays, KS; Donna Lehmann and husband, Anand Mukherjee, Brooklyn, NY; two brothers, Steve Barker and wife, Suzanne, Kearney, NE; Dave Barker and wife, Cathy, Lawrence, KS; two grandchildren, Oscar and Nora Mukherjee. Services will be at 10:00 A.M. Friday, May 25, 2018, at the First United Methodist Church, 7th and Ash, Hays, Kansas. Burial in Fort Hays Memorial Garden Cemetery, Hays, Kansas with military honors by the Hays V.F.W. Post No. 9076. Visitation is from 6:00 to 8:00 P.M. Thursday, at Cline’s-Keithley Mortuary of Hays, 1919 East 22nd Street, Hays, Kansas 67601 and from 9:00 to 10:00 A.M. Friday, at the First United Methodist Church, Hays, Kansas. The family suggests memorials to the First United Methodist Church or Hospice of Hays Medical Center.